Nowadays, the keratin hair straightening treatments are absolutely a rage. When it comes to taming thick frizzy locks or crazy unruly curls, people simply swear by this treatment. If you also need to struggle with your unmanageable hair and are looking for a way to curb your at-home straightening time, the keratin treatment can turn out to be your savior. But wait! Do you know what is all the fuss about? If not, we are here to help you out. So, know everything about a keratin hair straightening treatment and find out whether it is worth a shot. What Is Keratin Hair Straightening Treatment? The Keratin Treatment, also referred to as the Brazilian Blowout, is a hair treatment in which the damaged parts of our hair are restored and rebuilt by treating the entire hair with ‘keratin’. Now, the question is, what is ‘keratin’? Well, ‘keratin’ is a type of protein that works as the primary building block for our hair and is key to its proper maintenance. Typically, our hair loses keratin as we age or when it exposed to heat styling, chemical treatments, synthetic hair care products, etc., thus looking dull, damaged, and uneven. A keratin treatment reintroduces ‘keratin’ into our hair strands by adding a layer of protein to it, followed by strengthening as well as relaxing. This makes the hair super sleek and extremely manageable while giving it a salon-like shine. 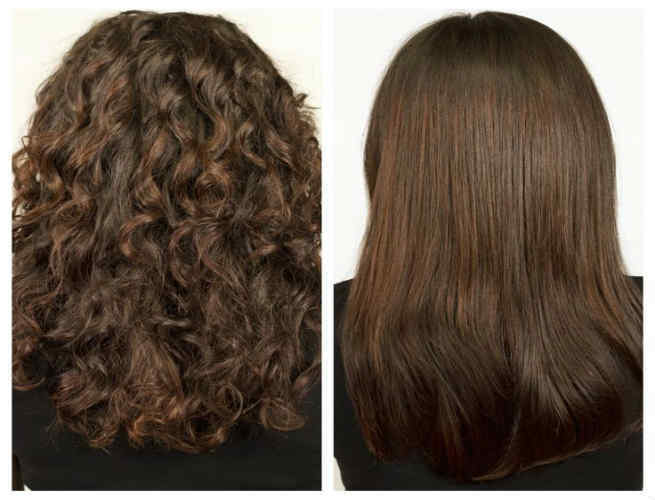 Though called a ‘straightening treatment’, the keratin treatment is, in reality, a ‘relaxing treatment‘. It smoothes out frizzes and facilitates the at-home sraightening of hair instead of making it permanently sraight. Precisely, it makes the hair lot more resilient so that it turns smoother, sleeker, and easily manageable. The hair is cleansed and washed thoroughly with a cleanser suitable exclusively for that specific type of hair. Then, a keratin hair straightening serum, containing dollops of keratin and conditioners together, is applied all over the hair after dividing it into small sections. It is ensured that each hair strand is covered nicely by the serum. Next, the hair is ironed out meticulously to activate the treatment and seal the keratin with the help of the heat. Meanwhile, the hair gets straighter, sleeker, and smoother. Finally, the hair is washed once more in order to rinse out the treatment, which is followed by drying and re-straightening. Do not wash your keratin-treated hair at least for next 48 hours. No. you cannot use even a single drop of water! Stay away from tying up your hair in any way for next 2 days. You may also want to be careful with your sleeping positions. Avoid all sorts of styling for at least a couple of days. Make sure that you use only sulfate-free shampoos and conditioners as long as the effects of your treatment are there. Needless to say, the Keratin Hair Straightening Treatment is a time-consuming process. It takes anywhere between an hour and a half and three hours to complete the treatment depending on the length, thickness, and texture of the hair. The effects of one treatment usually last for around 3 months (all after-care rules should be followed religiously). It takes about USD 200 on average to treat medium-length hair using this method. However, it will, again, vary based on the length and thickness of the hair as well as the reputation of the salon. Once you get the straightening treatment done, you can bid good goodbye to frizzy hair (especially around your hairline) for a good three months. The additional coating of keratin will help you safeguard your hair from sun and environmental damages. As the keratin in the serum helps in rebonding and strengthening the hair, it becomes more resilient and less prone to breakage. The hair becomes much softer, smoother, sleeker, and shinier. It cuts down your blow-drying time so much that you can even go without it. As the hair gets straighter and sleeker, it will look and feel limp. You may really miss the volume in your hair after the treatment. The hair can turn greasy very quickly as the frizzes will not be there anymore. You cannot wash your hair for a couple of days after the treatment. So, try to keep a dry shampoo handy. You have to use a specific shampoo and conditioner so as not to damage the treated hair. The shampoo and conditioner have to be sulfate free, and preferably ones that come along with your hair straightening product. You need to ensure that your hair does not come in contact with water when you go swimming. The treatment can be pricey for a result that lasts only for three months. It is always advised that you go to a reputed salon as there are also some side effects of the keratin treatment. The serum used in the keratin hair straightening treatment can contain formaldehyde. When inhaled, formaldehyde can cause throat and eye irritation, nausea, and skin sensitivity. Even the products labeled ‘formaldehyde-free’ can also contain methylene-glycol or formalin, which can cause the exact same side effects as formaldehyde. So, before you get your treatment done, ensure that all the safety precautions are going to be followed properly. Formaldehyde solution is used to keep the hair in its straighter condition for months, but it has been found to have carcinogenic properties and hence, should be strictly avoided to avoid future health hazards. The hair treatment offers promising results for unruly and damaged hair by making it look straight, shiny, and fabulous. However, if you decide to go for one, make sure that you find a good professional who knows how to do the procedure with utmost care so as to not leave behind any nasty side effects. That way, by spending three hours into the treatment, you can emerge with straight and lustrous locks.